Bees and flowers need each other. Bill Wilcox put a bee in my bonnet last week. Many of you know or will remember Bill, who spent 37 years as a teacher, scientist, water quality expert, and Island public servant before retiring a few years ago. Bill emailed me to help him get a buzz going for an important educational program on native bees on May 9 at 7 p.m. at the Agricultural Hall. As chair of the Dukes Conservation District, Bill knows the importance of native pollinators, especially bees, and wants to spread the word to farmers, gardeners, landscapers and homeowners. And he is not alone in his conviction. The recent reappearance of bees is not surprising, coinciding with a burst of flowers that bloomed seemingly everywhere you looked. On the Island, bees are in flight April through September, with the most activity in May and June. Bees and flowers need each other. In Massachusetts, insects or animals pollinate 68 per cent of flora. And though we often credit the European honeybee for its pollination services, it is the multitudes of the forgotten native pollinators that do the lion’s (or bee’s) share of the work. Native bees deserve much credit, and are impressive in their pollinating talent, diversity and sheer numbers. The Island is blessed with an incredible variety of native bees, with more than 160 species observed in a local study in 2011. Most of those, an estimated 90 per cent, are solitary bees that live and breed on their own, while the other 10 per cent are the social variety that include bumblebees and nonnative honeybees. In the solitary camp, there are the carpenter, swat, mining and mason bees, among others. Seventy per cent of solitary bees are ground nesters and the other 30 per cent are wood and tunnel nesters. There is room for all types in your home habitat. 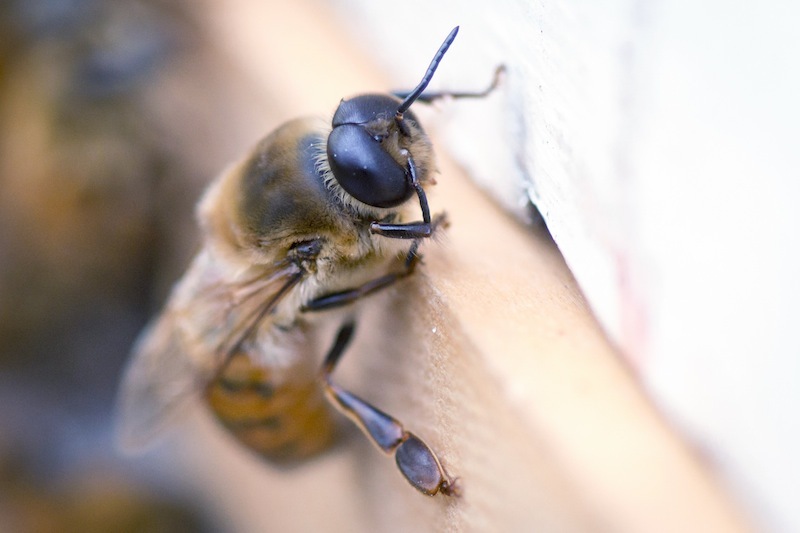 Consider these suggestions for welcoming bees to your backyard. For ground nesting bees, create a sandy open space or use a sand pit or pile in a sunny spot in your yard. Keep out the vegetation and perhaps some bees will begin to tunnel. Leave a flat rock for basking. Wood and tunnel nesters need tube-like areas for rearing their young. Create nest blocks by drilling 3/32” to 3/8” holes in chemical-free lumber blocks, logs or dead trees, three to six inches deep (but not all the way though). Stem bundles are another suggestion for wood and tunnel nesters. Use six-inch lengths of bamboo, teasel or reeds (open on only one side) and tie them together. Be sure the stem bundles’ openings are horizontal to the ground, and place the bundles firmly and securely to prevent the wind from blowing them around. Finally, be sure they take advantage of morning sun. So if the idea of attracting them to your yard makes your quiver, remember that many bees are incapable of stinging, and the ones that are capable want to sting you less than you want to be stung. And then consider your next meal, or those beautiful flowers, and the bees that made them possible. Hi Suzan, it's wonderful to find fans of native bees, that as you suggest, are the true backbones of pollination. Few people realize the difference between the sophisticated honey bees who keep most all grains of pollen stuck to hind legs vs. hairy abdomens on solitary bees that belly flop into a flower, and lose much pollen on each flower they visit due to the dry pollen falling off everywhere. We're working with gardeners everywhere to find native hole-nesting bees in their backyards. When did they show up, what size hole, etc.? Later, we'll get them identified, hopefully encourage their numbers, and ultimately shift them from only backyards into local organic farms for more food production. If you have a moment, please connect with me at info@crownbees.com. Thanks!